"The secret of everything is to let yourself be carried by the Lord and to carry the Lord." 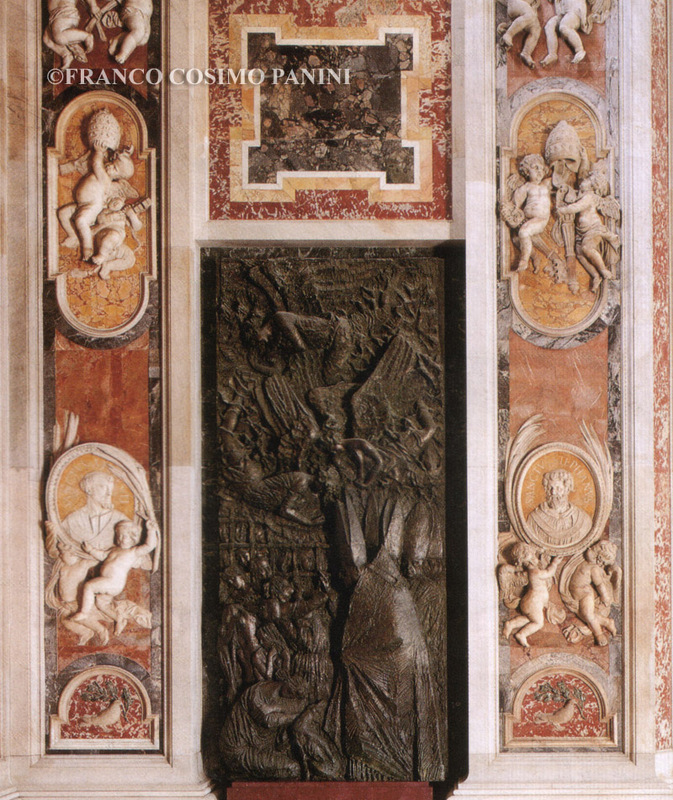 One of the scenes depicted on this monument is the pope visiting Regina Coeli Prison in Rome. He told the prisoners that since they couldn't come to see him, he came to see them. The bronze monument by Emilio Greco is a symbol of the Church's gratitude to the gentle Pope John XXIII (1958-1963) the "Good Pope". On the upper part angels are coming down to earth to announce the spring of optimism, hope and trust in man. In the center is the impressive, strong and human figure of the Pope visiting prisoners, children and the ill. The expression on his face is not the usual one of joyful optimism, but rather it is preoccupied because of the troubles afflicting today's world. A young mother holds her child up to the pope for his blessing. 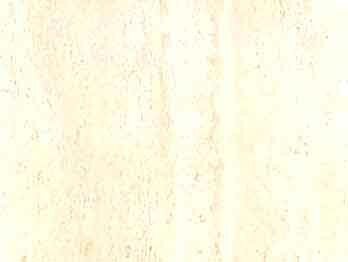 But the child, a symbol of the new generation the rejects the past turns his back on the pope who wants to bless him. On lower left, there is a young seated woman, she is tired, sad and disappointed, perhaps she is supposed to symbolize the politics and philosophies of today that are incapable of solving the difficult problems of a complicated world. At the bottom center, the only figure that looks at the pope with trust is a hungry, scrawny dog, symbolizing humanity that is starving for justice, love and peace. Above, behind the pope is a cardinal who holds his hand over his heart as if to say that the ills of today's world can be solved by listening to the voice of one's own conscience which is the voice of God, ever-present in our hearts. This monument is by Emilio Greco. Angels alone suggest optimism. The Pope, with a troubled face, visits prisoners, children, and the ill; a young mother asks for a blessing; a young child rejects authority and the past; a hungry, scrawny dog looks hopefully at the Pope - it symbolizes humanity starving for justice, love, and peace. This monument by Emilio Greco is negatively affected by its poor location, in a restrictive position, which does not make it easier to interpret the close-knit representation. 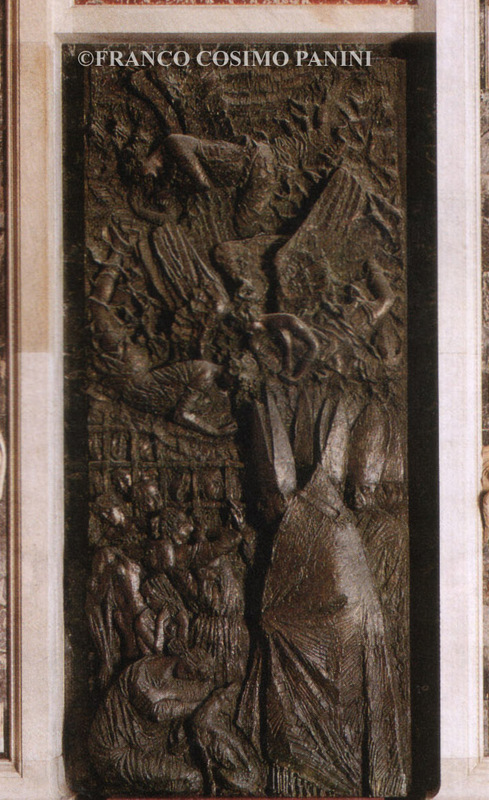 The artist made reference to his contemporary execution of the doors of Orvieto, which represents one of his best creative moments. 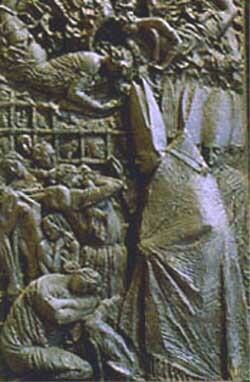 Thus for the "visit to the prisoners" he took inspiration from the Orvieto composition, efficiently depicting the numerous charitable actions of Pope John XXIII, while the prelates, in the background, refer to the second Vatican Council that he convened in 1962. The bas-relief, teeming with episodes, is based on a complex variation of colors and reflections, created by continuously breaking up the surfaces, thus generating very intense emotions. 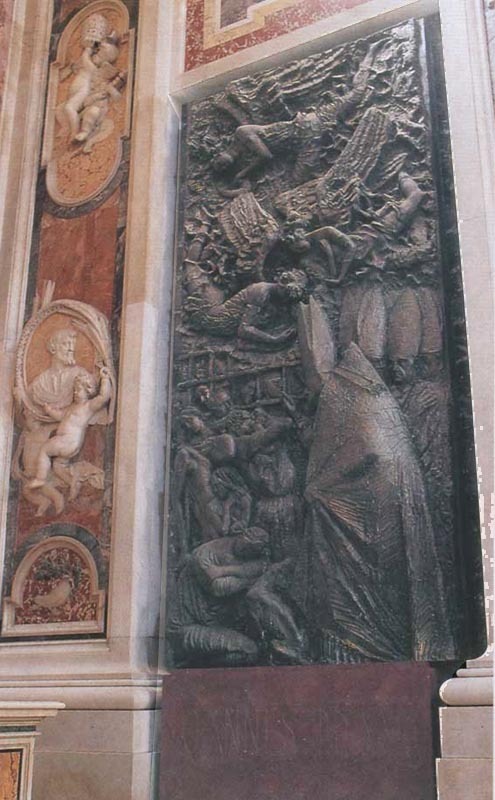 The massive cloaked figure of the Pope stands out in this complex group of figures and events that are presented like a rapid series of photograms. 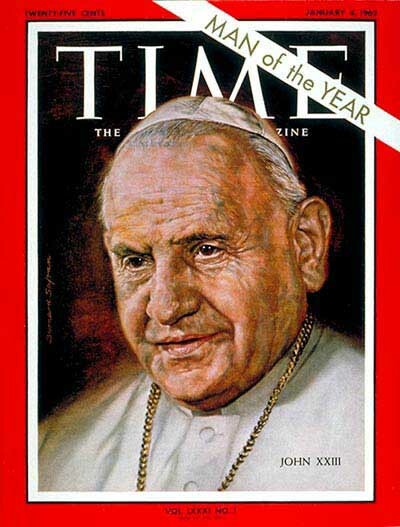 However, John Paul continued, the greatest gift that Pope John XXIII gave to the Church was not the Council, nor his reputation for humor and good will. 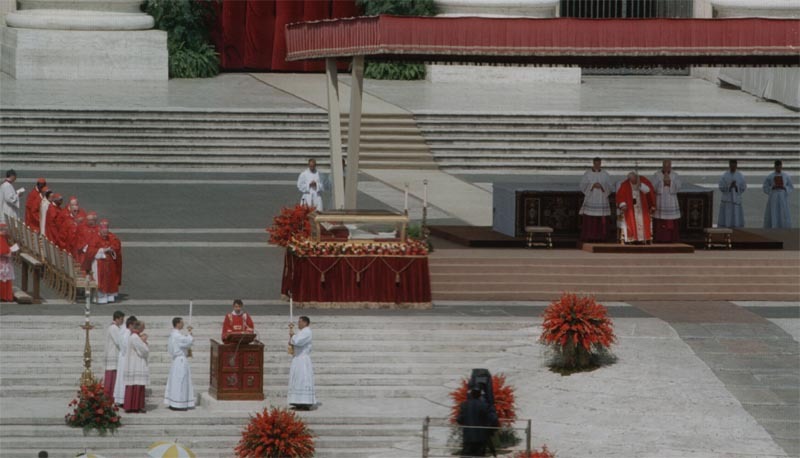 “The most precious gift left by Pope John to the People of God was himself: his witness of sanctity,” he said. A favorite story from his long repertoire of amusing anecdotes is one he told about three sure-fire ways to lose money -- gambling, carousing and farming. Regrettably, he says, his father chose the most boring of the three.